My expectations of who is and isn’t coming for thanksgiving this year have changed. My daughter and her husband can’t come as planned because of needs in Jason’s family, which we totally understand and support. Our son and his wife and kids have decided not to come because of their schedules and they were just here two weeks ago for Laura’s wedding. Again I understand and we support them. Our doctor son-in-law is on call this year over the holiday so their time with us may or may not happen. We already knew our daughter who is due with baby #5 at Christmas would not be coming with her family. Since none of our children and grandchildren live in town it’s not possible to drive over for even a few hours on Thanksgiving Day. It’s pack suitcases and come stay or nothing. And so I have and I will continue to give thanks. And I will enjoy the gift of having two of my children and their spouses and four granddaughters home for a much smaller more intimate and hopefully more meaningful Thanksgiving. Rather than forego traditions, we will continue them knowing that they feed togetherness, stability, and create shared memories. 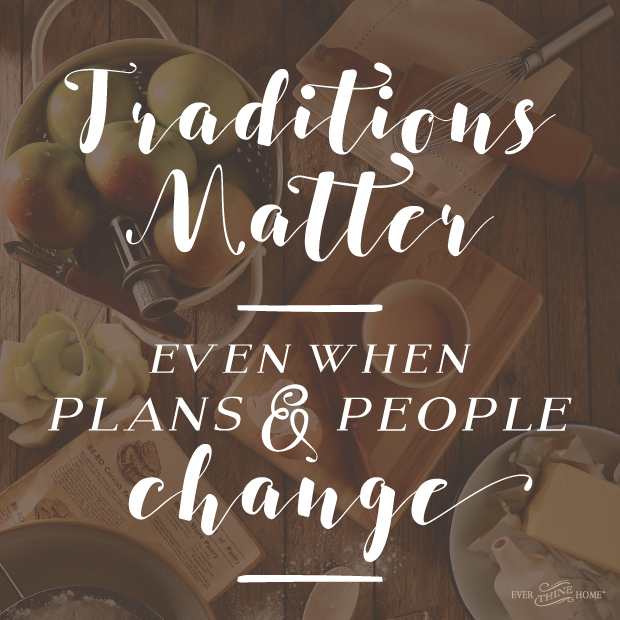 Traditions are simply repeated actions that reinforce values. Noel Piper has written, “Only God can give our children a taste for his sweetness. Only God can awaken them to His worth. But He uses God-centered traditions and family patterns. Our traditions can show children that God is our treasure.” So for my own grown children and for these grandchildren of mine we will repeat our annual reading of the Thanksgiving story from the book Thanksgiving, A Time to Remember. We will make the same brunch meal of company French toast and southwest egg casserole (I shared our family recipe in a recent post) and we will share together the milestones of God’s faithfulness to us this year. Maybe your plans have changed too, and not for the better. Maybe you are alone again this year and wish you weren’t. Maybe you want to create meaningful moments with your family that weren’t modeled for you growing up. What if God has changed your heart, and you want to overhaul some old traditions to align them with your faith? My challenge and encouragement is to make this Thanksgiving memorable in ways that are worth it … and feasible no matter what your situation. Here are four ideas to easily, practically add value and meaning to your holiday gathering. Invite others. Sharing our tables is one of the most uniquely human things we do. No other creature crafts a meal, sets the plates, and rings the dinner bell until everyone is knocking knees underneath this kitchen centerpiece. Don’t feel it has to be a crowd. Even inviting one other person who might be alone this year to join you is a way to model the love of God for others. There is more to a meal than simply the physical sustenance. To have a place at the table is to occupy sacred space. To share stories. To remember where we’ve been. To dream of where we might go. To laugh together. To cry together. To know and be known. To reflect the heart of our relational God and sense His nearness in these moments. Save a seat or two for someone who might need to share in that lovingkindness this year. Sharing a meal nourishes us both physically and spiritually. Share your heart. Since most of us so rarely stop to truly connect with those around us, the day that we pile plates to squeeze around the table can be challenging or uncomfortable. The mixture of great grandmas and teenagers, neighbors and friends from around the world, football games, and mobile devices may leave us feeling at a loss for what to talk about and how to engage. But don’t miss this sacred moment you have to remember truth and create meaningful interaction with your people. Try using a simple conversation starter like Untie Your Story—fabric napkin ties each printed with a question to invite open-hearted conversation focused on gratitude or childhood memories. Not only will these ribbons add a vintage feel to your table, they will also give everyone something to do with their hands as they untie the ribbon, read the question and feel the soft fabric between their fingers, and wait their turn to share a tiny piece of their heart. Thank our God. The Thanksgiving table, above all, is a place to remember the blessing of God. One ancient Hebrew prayer says, “Blessed are you, O Lord God, King of the universe, for you give us food to sustain our lives and make our hearts glad.” We need to recover the importance of gathering with people around our tables for the purpose of enjoying a meal as both a gift and means of grace. A very easy way to thank God is to give each person a plain or purchased decorated card on which to record a list of God’s good gifts over the past year. Listing all that God has done or how He has worked is an important exercise for it reminds us of His past faithfulness and strengthens our faith for tomorrow. 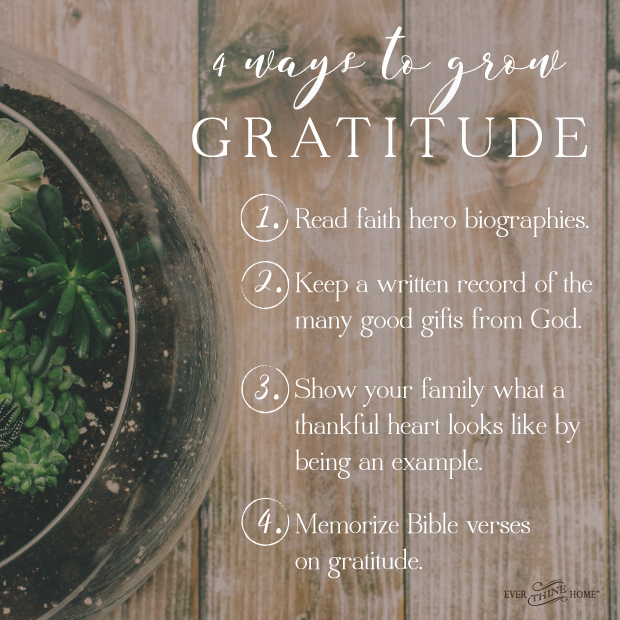 (See the bottom of this post for an easy printable for 4 Ways to Grow Gratitude that will help your guests craft their lists.) Everyone can read their list out loud if you choose. Traditions are worth it. They are vital to the life and health of your family. Don’t let disappointments or trials keep you from continuing or beginning traditions that are one of the means God uses to bind us together and to Him. 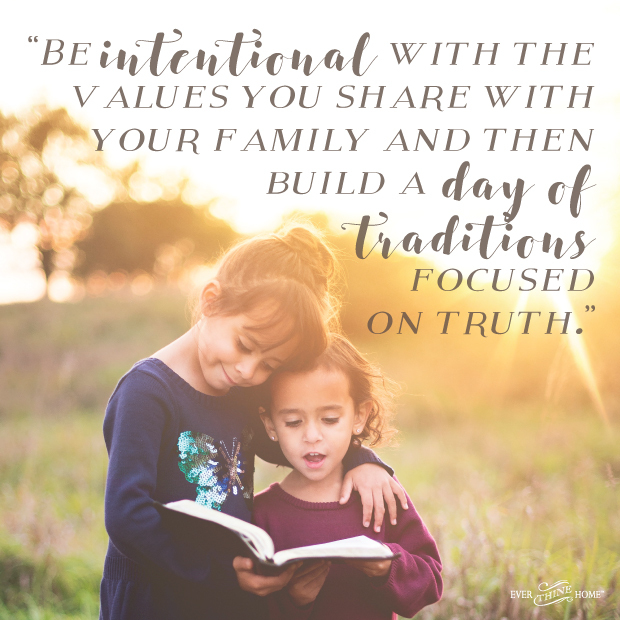 Be intentional with the values you share with your family and then build a day of traditions focused on truth. Soon the Thanksgiving meal will be over. The table will be clear. Legs will be propped up on the coffee teable and you’ll be drifting into an afternoon nap—content and thankful that you made your time together meaningful and centered on the One who provides it all. This encouraged me because you shared real life. This is the real world for many of us. It’s easy for those of us on this side of the screen to imagine your life being picture perfect…and we know ours isn’t. This scenario happens more at Christmas in our household…but the same wonderful principles still apply! Hi Barbara. I love your ideas for Thansgiving and of keeping the focus on our values. I have tried this year to talk to my husband about doing something that would get our focus on the season and to remember what God has done for our family. His family can tend to be somewhat negative so I wanted to make our time together positive not a chore. When I mentioned my idea to him his response was “why do you have to create an activity to make a memory, bring together is the memory.” What can I do to turn our focus on gratitude and not attitude? And keep it short and simple. Even baby steps are ok when turning your family toward gratitude. Thank you, Barbara! You are a blessing to me! I love ETH and all your ideas for making our home glorify the Lord! Is the french toast recipe the same as the southwest egg casserole?? Or are they two different recipes you make? I hope to do this on Thanksgiving Day! Hi, Mary. Thanks for your encouragement. The recipes are different. We always made one of each for our family. Here’s the recipe for the Southwest Egg Casserole. Beat eggs in large bowl. Combine flour, salt and baking powder. It will be lumpy. Add cheeses, chilis and butter. Pour into greased 9×13 pan and bake uncovered at 350 for 35-45 min or until knife comes out clean when inserted into the center. Let stand for 5 minutes before cutting into serving pieces. The best part is that it can be prepared ahead and kept in the fridge overnight. So my Thanksgiving morning food was prepped the day before! Barbara, these posts have been so helpful, as well as hearing you speak on the radio last week. Our family was together last weekend to be with our oldest. He is away at college and it was Parent weekend. I planned some family meals at the cabin we rented. One of our traditions is whenever someone has a birthday, we each go around and share something we are thankful for about hat person. Well, it’s been a busy fall and in our busy-ness, for various reasons, we neglected this tradition with fall birthday kids! Which, by the way is four out of five kids! Oh my. I was determined to go around the table and have us share. It started out not as planned and I feared it would end in disaster. But that morning I had just heard you speak on Thanksgiving traditions and how some years it didn’t always go perfectly. So, rather than give up, we continued. I didn’t get upset or emotional that it wasn’t “perfect,” and by the end, we made a beautiful memory and blessings and encouragement were shared to all four children by all of us. Thank you, Barbara & Dennis ;), for encouraging Moms & families!